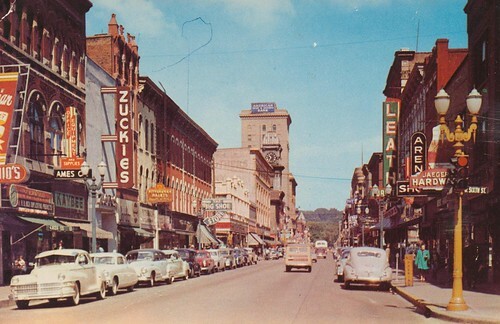 Main Street - Dubuque, Iowa, a photo by The Pie Shops Collection on Flickr. I just returned from Brooklyn NY and were it not for the absence of skyscrapers in the distance and the mid-centry jalopies on the curbs this photoscape of Main Street Dubuque could fit in any major Eastern metro area. I love the vibrancy of the storefronts, the activity on the sidewalks. Pretty much everything about the shot.